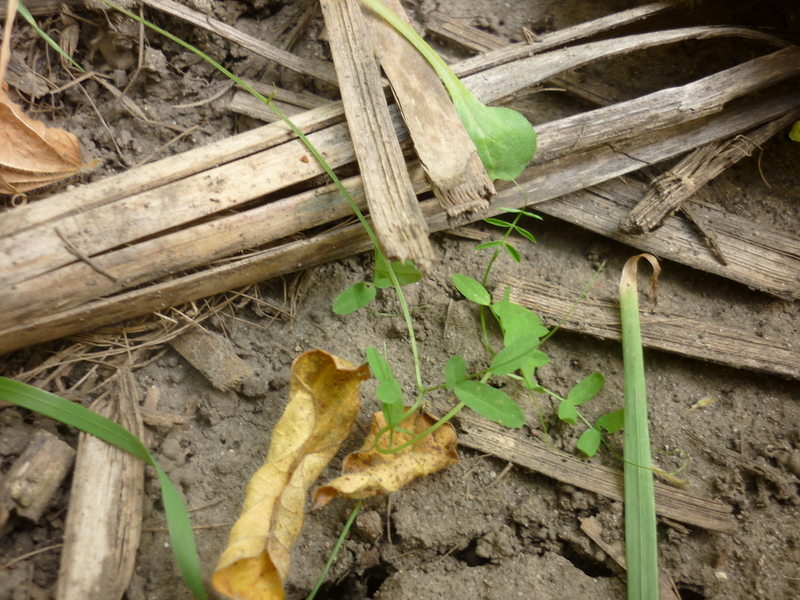 What happens to all of that cover crop biomass? This has been an amazing fall (and winter) for cover crops! Driving around the state, it makes my day to see those lush fields of green. In an earlier blog post titled The weather outside is frightful, but the cover crops are oh SO delightful!, we showed you some of the beautiful cover crop growth that was achieved at the ISU Armstrong Research Farm near Lewis in southwest Iowa, as documented when we were there collecting fall biomass samples in late November. Once the biomass is collected, what happens next? Let’s go on a bit of a behind-the-scenes tour documenting the next steps in the processing and analysis of the cover crop biomass. When sampling the cover crop biomass in the field, all of the above-ground biomass from each PVC frame is harvested and transferred to a brown paper bag. Once we’re back to campus, the bags are transported to the porous media lab in Sukup Hall, part of the brand new Biorenewables Complex that houses Iowa Learning Farms and ISU’s Department of Agricultural and Biosystems Engineering. Each individual bag is opened up immediately and allowed to start air drying; it is important to start the drying process right away to prevent wet samples from molding or any other sample degradation. With 6 research farm sites and 10 on-farm demonstration sites (each with multiple replicated treatment strips) where cover crop biomass was collected, you can imagine that we have collected quite a few bags of cover crop biomass by the end of the season! SORTING of the biomass comes next. 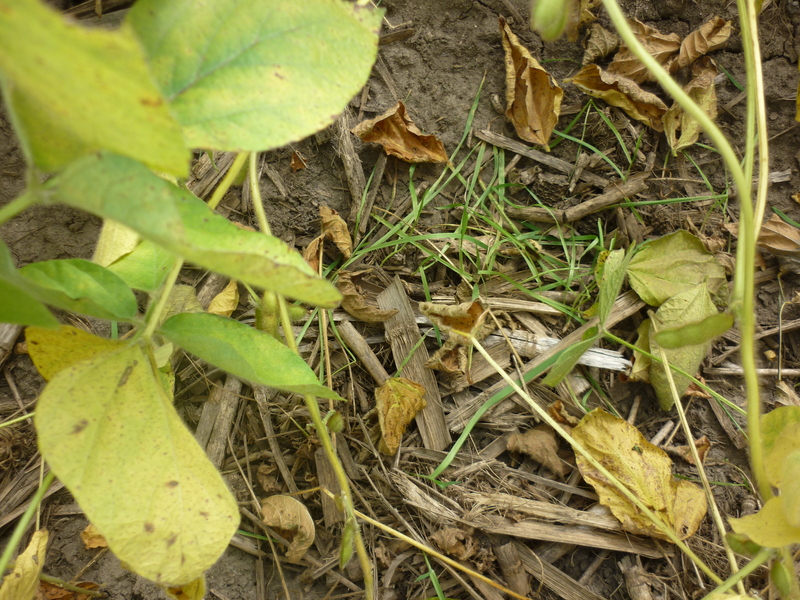 The goal is to collect just the above ground cover crop biomass, so the first step is sorting out any non-cover crop material from the bag – including soil, corn stalks, soybean residue, and trimming off any cover crop roots that may have been collected. Since many of our demonstration projects involve cover crop mixtures, then we begin sorting the biomass by species in order to determine how much growth was achieved by each of the species in the mixture. This sorting is done visually, using photographs of the individual cover crops to identify and sort the cover crop biomass on a species basis. Here, intern Kayla Hasper sorts a cover crop mixture that includes radish, hairy vetch, and oats. The biomass from each species is put on its own pile, and once fully sorted, each individual species is transferred into its own brown paper bag. Samples are dried at low heat (60C) for 48 hours to remove any remaining water. Each individual species sample is then weighed. Knowing this dry weight measurement as well as the size of the PVC frame used for sampling, we can calculate the amount of biomass grown in the field on a lb/acre basis… per species, as well as the total lb/acre for the mixture. We’ll do the same thing in the spring to see what kind of growth is achieved then. Finally, the biomass samples are submitted to ISU’s Soil Processing Lab in the Agronomy Department to determine the Total Carbon and Total Nitrogen makeup of the plant biomass. These numbers can then be related to the Total Carbon and Total Nitrogen in the soil, the nitrate concentrations found in the water samples collected from each plot, and the crop yields in each plot… each individual piece of data helps us gain a better understanding of the big picture in terms of the numerous benefits of cover crops integrated into corn and soybean cropping systems! 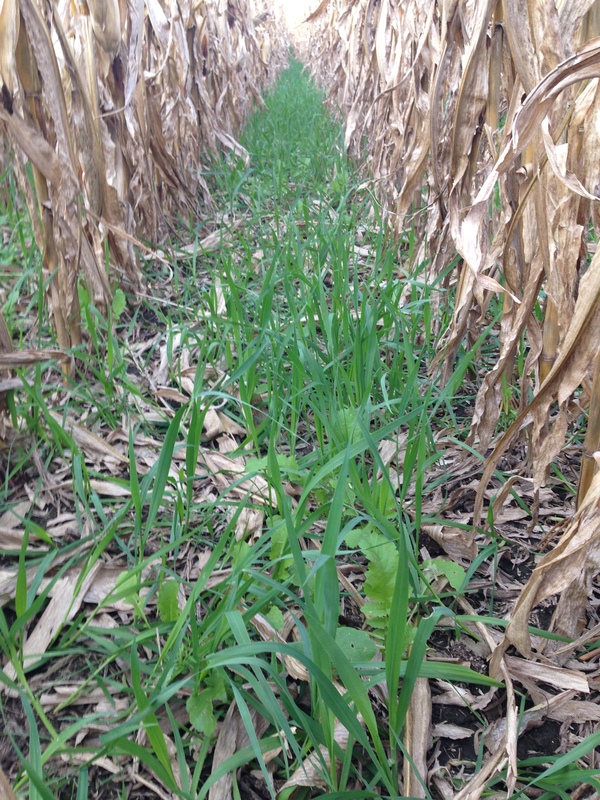 Cover crops are an important tool in the Iowa Nutrient Reduction Strategy that can help meet the goals of reduced nutrient loss from the state. From the ability to protect the soil from erosion when the fields are typically brown to cycling nutrients and improving soil, cover crops can provide many benefits. 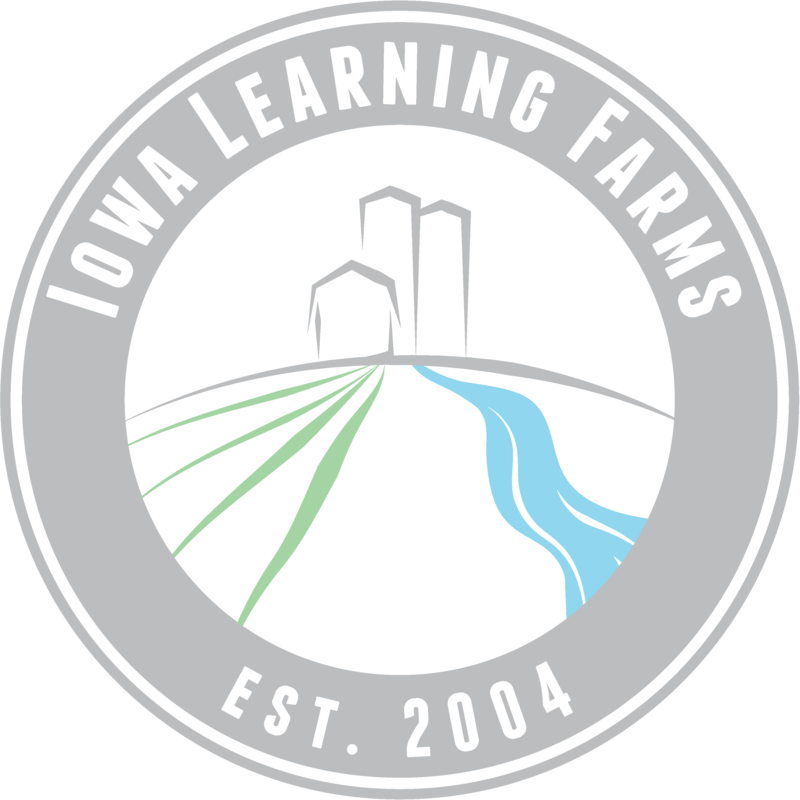 However, there are still many questions that come into the Iowa Learning Farms about cover crops. Most asked questions include: what kinds of plants can be used, when and how to seed and when and how to terminate. With help from fellow Iowa State University, Practical Farmers of Iowa, USDA-ARS-National Laboratory for Agriculture and the Environment researchers, ILF strives to help farmers, and other interested people, find the answers to these questions and more through ongoing cover crop research and demonstration projects. 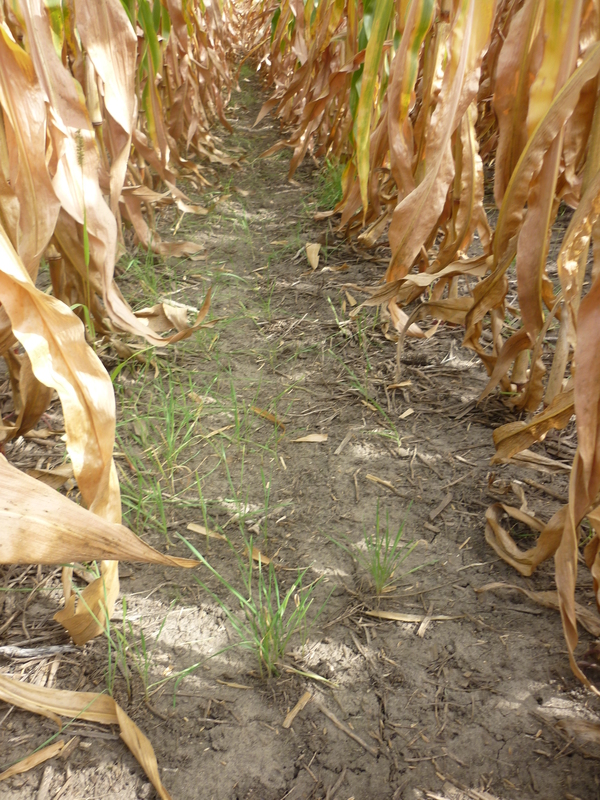 Now available on the ILF webpage is a directory of 60+ cover crop projects led by ISU and colleagues. This sortable file contains brief descriptions of the projects, as well as contact information to learn more about each one. Also available, is a list of cover crop research and demonstration projects in Iowa compiled by Clean Water Iowa through the Iowa Department of Agriculture and Natural Resources. As the harvest season continues, fields across the state are beginning to come alive with cover crops. The Cover Crop Working Group mixed species demonstration site in Nashua is among those fields coming alive this fall – just in time for Halloween! 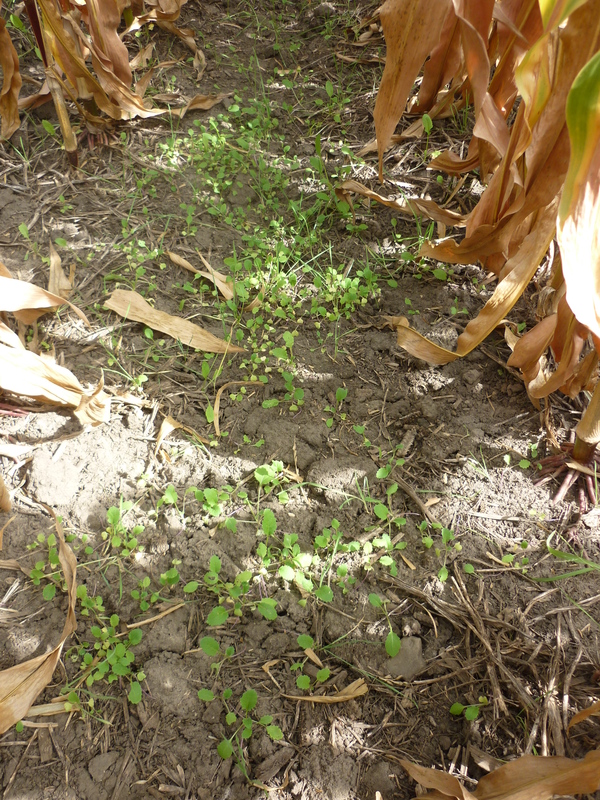 During a visit to the site in early October, the cover crops had begun germinating even before the corn and soybeans had been harvested. In the upcoming weeks, the team will be heading out to evaluate the cover crop stand and collect soil samples for total nitrogen, total carbon, pH and total organic matter. Check out photos from Nashua below and read our earlier post To Mix or Not to Mix My Cover Crop Species for more information about the project.